Need a one coat black? 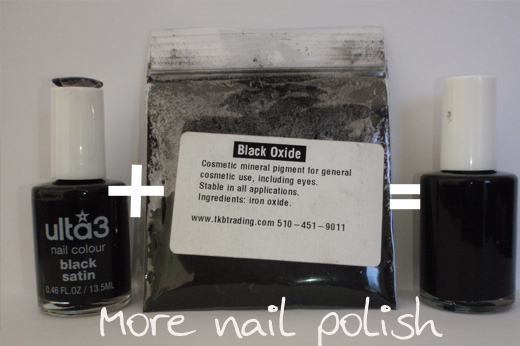 I'm sure you would agree that a good opaque black polish is an absolute must in everyone's collection. I think it's pretty well known for ladies that have access to Wet N Wild nail polish, that their Shine Black Creme is a great one coater for when you layering polish. For those of us without access to Wet N Wild, we need to make do with whatever brand we can find. I was starting to get a bit jack of my staple black polish when I was doing my Ozotic multichrome swatches. I was using Ulta3 Black Satin, but to get it opaque you have to use two coats. So what do you do in this situation, you franken it! I had already purchased a Mica sampler pack from TKB Trading. So I had a baggy of black oxide pigment. This stuff is great because it is so pigmented. I added probably about a teaspoon of mica to my bottle of Ulta3 Black Satin, a couple of ballz and shook the bejesus out of it. Here is a swatch of one coat each of the original Black Satin and my frankened version. Can you tell which is which? Tee hee. So now I have a perfect black one coater. That's a really great idea, thanks for posting! I don't like the name (black oxide) but I love the result!! very cool! it's tkb trading btw, not tbk. That is AWESOME!! I was only thinking the other day a 1 coat black would save so much time. the BYS black satin is an AMAZING one coat black... but it smells a little! I have a couple of back ups, I couldn't live without it! You are brilliant. Thanks for sharing! American Apparel Hassid is my go-to one coat black polish, if you have access to their polishes! I bought WNW as a backup but I definitely prefer Hassid! It works great for Konad as well.